Well, this one certainly caught me off guard. The only adult sheep in the field that wasn’t completely covered in a year’s worth of thick fleece. Yet not completely shorn, either. Did the farmer get halfway through and discover his shears just weren’t sharp enough to continue? Did he suddenly get word of an impending blizzard and want to leave this poor ewe with at least some protection from the elements? Was the ewe acting up so badly that the farmer couldn’t finish the back half of the shearing job? Are wool buyers now refusing to purchase wool that contains clumps of poo? 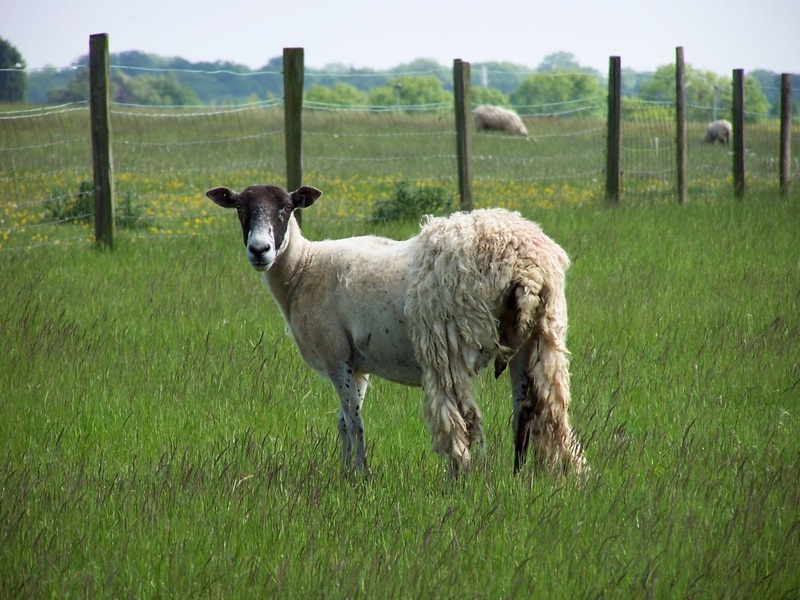 Are woolly chaps the hottest fashion trend in the pastures this spring? Oh, if only an animal could talk, so I could get to the bottom of this ovine mystery.